One of the most timeless interior design styles is the neutral look. Highly versatile and adaptable, it taps into the everlasting beauty of a natural colour palette. The living room has a careful balance of big sweeping lines and a cosy, textured rug. The sofa we see to the right has a unique curved back that really curves into the space—making it extra homely. The dining room area has very distinct boundaries, but that has been created by the simple use of a series of pendant lights. 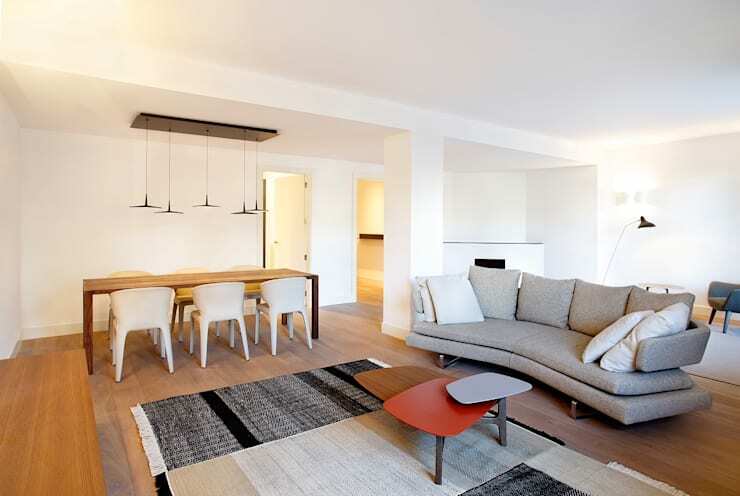 This is a good example of how furnishings can create different zones within an open plan layout. 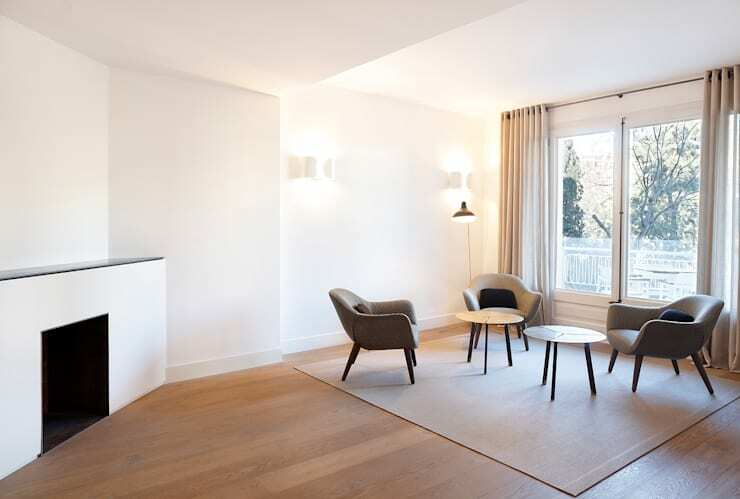 The power of empty white space is undeniable here in this simple sitting room. It is an extremely tricky look to pull off, because it can easily look unfinished or undone. This kind of minimalist decor really throws attention onto every little element in the room. The fine edge of the soft grey rug, the subtle symmetry between the two round tables and the subtle wall lamps all have a role to play in the balance of this room. The master bedroom has lots of fine lines, combined with big chunky comfy features. The contrast between the abundant features and the fine lines is really something in this picture. 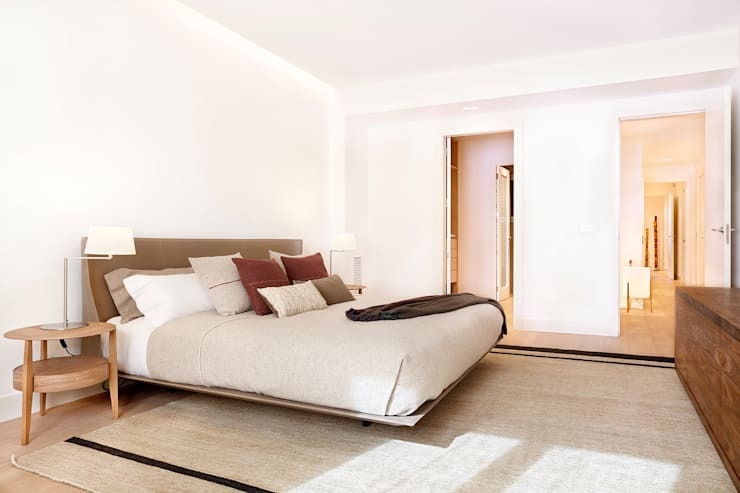 Note how the bed seems to float within the space and the recessed light that runs along the wall. Black is certainly not the first choice of shade for most kitchen designers. 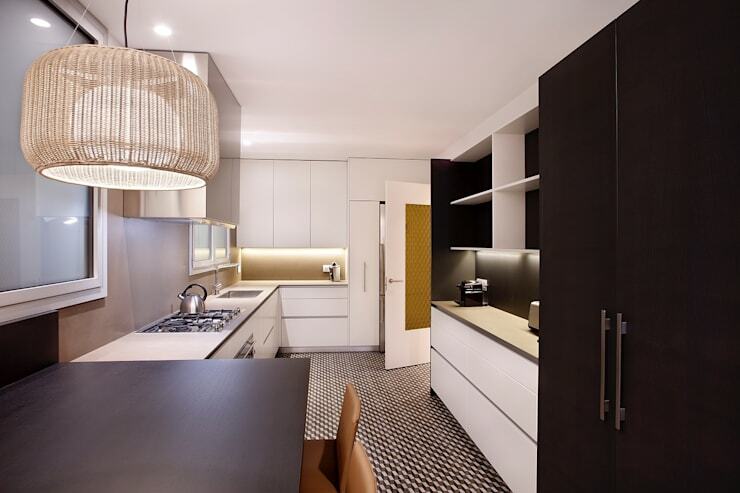 But here, we can see how a restricted use of black can add drama and sophistication in a monochrome kitchen design. In the foreground is a breakfast bench that adds something different to the design. Note how the black cabinetry is well lit. Many Spanish apartments have internal windows overlooking an internal stairwell. This one, seems to have a similar design which has been lightened up with a big mirror and a glass shower enclosure. 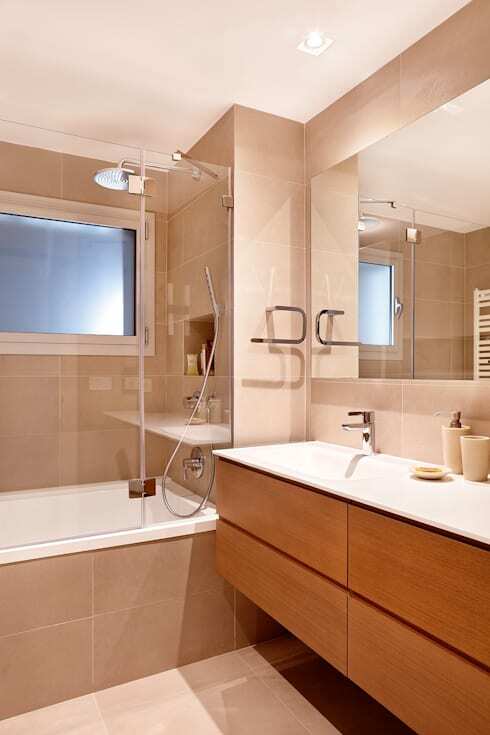 The beige tiles run all the way to the ceiling and envelop the bathroom in a soothing ambience. Another element of interest is the big, wall-mounted storage cabinet. Here we have another example of the combination of fine and chunky lines. 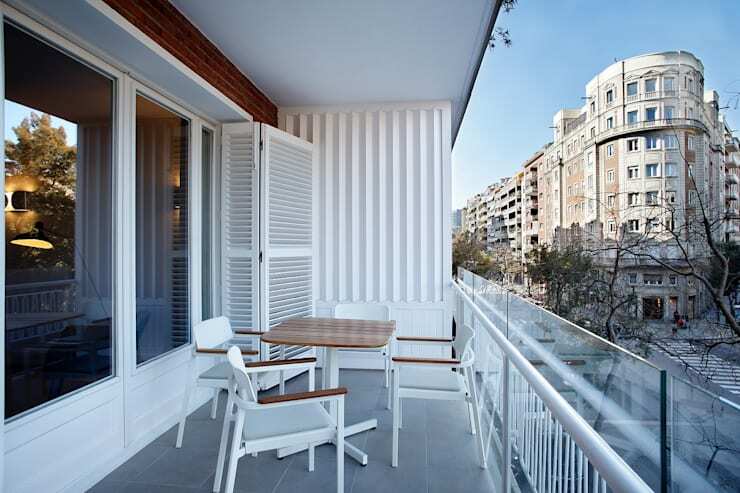 A covered balcony is an absolute must in sunny Spain. This one has wooden shutters that are used to help keep the home cool during the heat of the day. An interesting outdoor furniture set adds a touch of natural warmth to a minimalist theme. Next we have another minimalist home in Spain with a slightly different approach: A modern 50m² flat with seriously space-saving design. Which aspect of this home most interests you?